The design of reliable containment vessels in the nuclear and other industries is of utmost importance. For such designs reliable finite element analyses of vessels are needed to assess the load carrying capacities in accident conditions. The required finite element simulations must trace out the response for the nonlinear behavior accurately, to predict the ultimate load that the vessel can carry. Here we feature some work that was carried out by the Gesellschaft für Anlagen- und Reaktorsicherheit (GRS)mbH in Cologne, Germany. The study was performed on a containment vessel of a typical German nuclear pressurized water reactor. 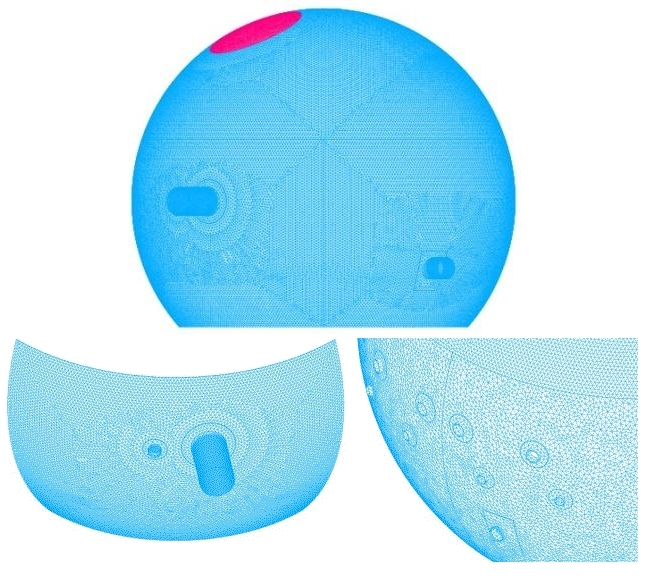 The containment of the nuclear pressurized water reactor has the shape of a spherical shell, and is made out of steel, with the objective to act as a leak-tight barrier against the release of fission products into the environment. 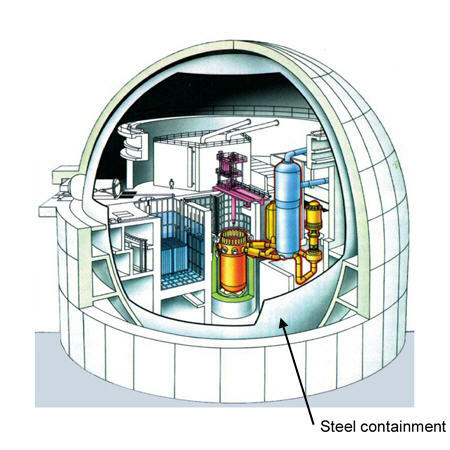 Figure 1 shows the reactor building with containment vessel and interior equipment. For the evaluation of safety margins against the loss of integrity in case of severe accident loads, due to postulated hydrogen combustion, GRS used ADINA in an elasto-plastic dynamic analysis of the structure. The modeler ADINA-M was used to build up a complex finite element model including the hatches, pipe penetrations and variations in the wall thickness. Figure 2 shows the mesh used with 388,479 tetrahedral elements with 178,698 nodes within 6 element groups. The complete analysis was performed with typically 3,000 time steps using implicit time integration with a time step size of 0.00005 s (0.05 ms). A parametric study was performed to investigate the sensitivity of the structure considering its stress- and strain-based integrity. Different loading assumptions and peak values were used that adequately postulate the accident hydrogen combustions and detonations. Figure 3 gives a typical postulated pressure loading applied to the inner surface of the vessel over a circular part. 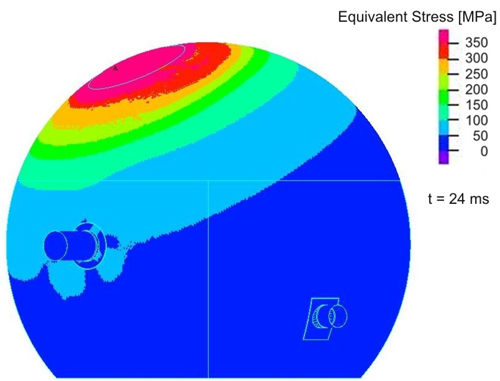 Figure 4 shows the equivalent stress distribution due to the dynamic pressure loading within the dome region of the inner surface (red region in Figure 2) of the steel containment at 24 ms. 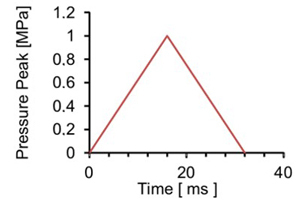 The above animation shows the progression of the stress distribution as a function of time. As expected, the maximum deformations occur in the region where the pressure acts and the maximum stresses and plastic strains naturally too. The deformations correspond to a local oscillating displacement as typically observed in the dynamic analysis of shells. The calculations show that the analysis method used here, based on ADINA, is suitable for the integrity assessment of steel structures loaded by hydrogen combustion, respectively, detonations. The work has been performed in the framework of the Reactor Safety Research Program of the German Federal Ministry of Economics and Technology. This is an important area in which ADINA is a most useful tool because of the program’s reliability and efficiency for nonlinear dynamic analyses.